Tusk Aluminum Handguards feature a large bend that provides exceptional brake and clutch lever clearance. Tusk Handguards are designed to fit a 7/8" bar, if you need to adapt them to a big bar please use the following adaptors. Strongest bar material I've found across brands. All the others bend more easily. I buy these to custom-bend in my press. They're the cheapest and the strongest, I believe because the bars are a thick, tempered aluminum. I use them in combination with D-flex Pro mounts, making a super stiff setup that has withstood many hard hits in the trees and rocks. After about 100 hard hits against tree trunks and rocky ground. Mandatory first mod in my opinion. Always install these First before ever taking my bikes out. Easy to install. Sometimes I tweak them some in a vice to get a great fit. Fast shipping from RMATV/MC as always. A good value if you’re on a budget and want to achieve the purpose and look I set up on my little cousins 2012 KX250f . He wanted the acerbis roost guards but with bark busters . . . . So I had to do a little plastic fab but definitely achieved the look and function, wish the aluminum bar was anodized Black. These are a very good hand guards that will protect your hands and levers from being broken at a very affordable cost .Have purchased this product for several bikes. Do there job just fine. I use the mx guards with them for lower profile look however lower profile means less protection, I do get whipped in the fingers Occasionally. Hold up very well durability hasn’t been an issue. 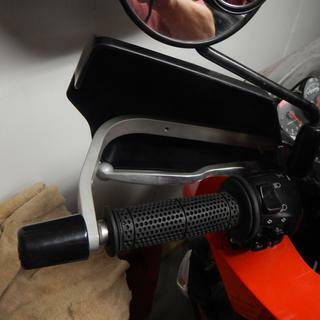 These hand guards are excellent, lower price than all the rest and just as good if not better. Protects your hands and fingers, protects your levers and perches from being broken off. Easy non-technical install. Thumbs up on these. Would buy again. Easy to install and built really well! I got these as a set with the MX handguards. Super easy to install, and RMATV has a video of the whole process of your not sure. Honestly, I did some of the big stuff and had my 10yo do the rest. Fit well on a 2003 Yamaha TTR125. Didn't have to bend or adjust anything. I didn't even say any cuss words!! They're built well, and will offer great protection. Really glad I bought these. While these are technically “universal” guards, I had to grind a metal cable-guide loop off my KLR’s handlebars to get these to fit properly. Once the tab was gone, they fit great! Used the OEM bolts to secure the guards back into the OEM bar-ends without any hassle. Another great Tusk product at a BERY competitive price point. Held up great and protected the controls during a spill on a ride yesterday. The only reason I didn’t give it 5 stars is I am unsure if I would be able to fit these with the stock clutch lever (I have shorty levers). Some reviews say they fit fine, others say different. These are a more affordable alternative to some of the other guards I looked at. I have used these on every bike i have owned. I crashed a dual sport on the highway (due to a bad front tire) at 55mph and i got zero hand damage nor broke any levers. Very robust construction and easy to install. Looks great and offers good protection. If you are looking for hand/lever protection this will fit the bill. After breaking a brake.... decided to buy these. easy to install and kept my brake levers safe on my next ride. I bought these to put on my girlfriend's YZ250FX. Before, I had put a set on my WR250R. They work great at deflecting wind and roost, and in the event of a tip over, they do an excellent job of saving levers. I wouldn't recommend them for A/B woods riders, as they are more likely to need replacement after a hard/fast hit. 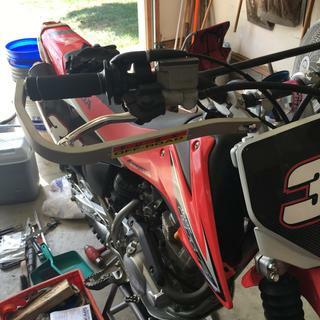 Installation is probably one of the easiest I've had for any wrap around handguards. I also like that the shield is cheap and easy to replace if needed. Used without the flags on the Kawasaki. Good fit. Hit a few trees and they held up great. 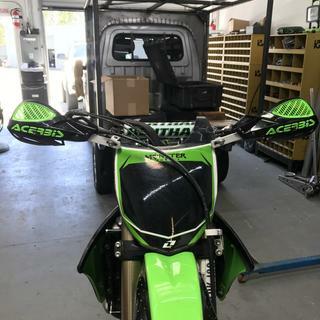 I've used Acerbis and other handguards but I wanted something more cost effective for my XR100 mini motard. These are the answer! Sturdy, easy to install and bullet-proof. Good job Tusk! Have these on several of my Honda xrs, love em. Great fit super tough and easy to install. Bought these for my XR400 and they fit great, thought I needed the big bar adapter but I did not. Less worried about dumping my bike now. Install was easy and I'm a noob rider. Make sure to have them tighten down, mine shifted after I dropped my bike on a ride. Very nice, quality, heavy duty product. 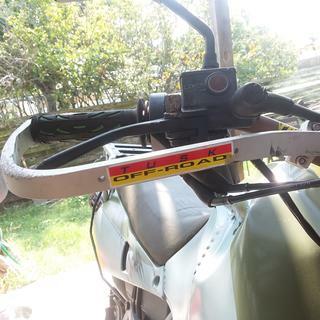 These are universal, so required some innovation to mount on stock KLR bars. Actually the right side mounted right up, the left side required me to drill a new hole at the inboard side because the handlebars had a permanently mounted wire harness guide that would not allow the pivoting guard thing to fit properly. Took my time marked it, drilled it, walla, no problem. Upside, I was able to mount the handlebar end weights using the screw from the guard kit and I was also able to mount the stock wind guards, with some minor trimming, to the Tusk guards, using the tapped screw holes in the Tusk guard. Awesome! The Tusk wrap around hand guards have been great so far. They were easy to install, look good, and function great. The price was also a great selling point. Let's see how they hold up in the long run. Great product! Even without the plastic shrouds they offer great protection. I bought these as a cheap solution to protect my levers and bars, being as I am a new rider. I needed the big bar adapter, but refrained from buying them for a little while. 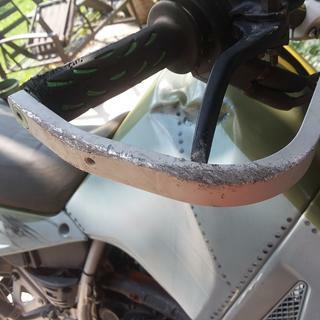 I dropped the KLR650 several times from a stand-still straight onto the end of the handlebars and there was no damage to the guards or my levers. I lowsided around a corner at about 25 mph, because I did not have them completely attached yet, they did move and my brake lever broke. The aluminum held up great being scraped over the road for a good 20 feet. I finally got the adapter mount. Installation was very difficult, because the aluminum is very hard to bend without the proper tools or strength. I was beating on them with a mallet and they barely budged. I did have to cut the levers to fit. The fact they do not bend easily greatly helped out during the highside crash I had. About 30 mph, violent enough to shear the handlebar mount off of the bolt and left a huge dent in my tank. The TUSK handguard bent slightly, but completely protected my lever from braking. Which means I could ride it home 50 miles and not have to get towed. The guard needs some adjusting, but it still has a lot of life. Fantastic investment for the budget rider who is prone to dumping. Absolutely will buy again once these have run their course. Only negative I have is the allen bolt on the end of the handlebars are very prone to stripping and being damaged in crashes. Which can make the guards next to impossible to tighten or remove. Fits great in stock bars. Great addition to my bike. Saves the grips and levers from getting torn up and broken, they have taken some big hits and survived. Bought these for my sons klx140L he's still learning to ride so they have hit the ground twice so far and held up perfectly They were very adjustable and fit the smaller bars without any issues. These look great! easy to install, only complaint is that the clamps dont really fit an aftermarket fat bar. Maybe they make an option for that? I just made them work. Easy install had both installed within minutes. Strong and well made. Great price. These guards are great value. 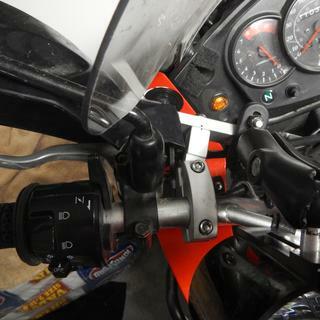 The swivel on the bar mount makes mounting easy and allows alignment of brake lines and clutch cable. These things work great though. Have these on 3 bikes, a 2017 KX 65, 2015 KX 85 and 2017 YZ250 FX. All fit great and look great. 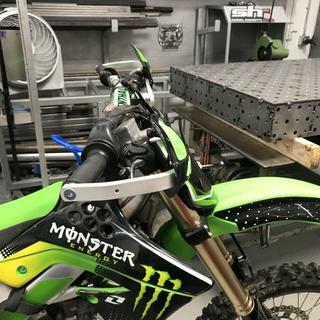 The kids bikes were no problem to fit, only on the 65 I did put a small spacer between the number plate and the top triple clamp to space the plate out from the gaurd mounts a bit but no big deal. They have held up great and stay tight even in hard crashes which save the levers on the kids bikes a lot. 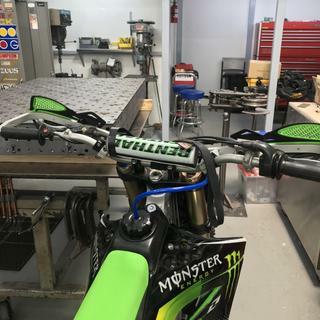 I used big bar adapters on the 250 FX and they went on flawlessly also and made no problems with lever fitment like I've had with other brands in the past. I had these on one of my bikes and absolutely loved them so when it came time for a switch on my other bike it was a no brainer. Great protection at a competitive price. Ill start by saying that these work awesome on a 7/8" bar as the mounting solution is awesome as they have an integrated swivel on the inside mount. Now on a 1 1/8" bar these are a complete nightmare. The additional mount that needs to be purchased is rigid with no adjustability so you are required to bend the guards into shape to allow fitment. This then causes you to bend an extremely thick material several times to get it "close". Even after messing with these for a better part of an hour I still couldnt get them positioned where I wanted and had to actually move my controls to better suite the poor fitment of these guards on a 1 1/8" bar. - 7/8" bar: good product with good fit. Ordered for my first harescramble on my yz125. Saved my hands on multiple occasions and still straight as the day I got them. Great product and great price. Highly recommend for max bikes with no hand protection. Good guards for the money, but not an easy install, and it doesn't fit evenly on my bike because of the brake reservoir on the right side, and the hot start (I think) on the left side. You really need a vice to be able to make the appropriate bends in the aluminum to make it fit, and I don't have a vice, so I never got a perfect fit. But it costs a lot less than most other guards, so I can't complain too much. Over all its been a good purchase, it has saved me quite a few levers. Not the coolest looking product but works as it should. 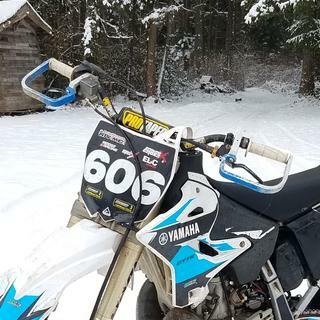 I needed handguards for a TT-R 125 play bike and did not feel like dropping $$$ for a set. I was quite surprised at the quality and fit, very well done. Will these work on a 2018 TW200? My honest opinion with be yes, since they seem to be pretty universal but you would honestly need to try them to find out. They fit on my 1985 3 wheeler so they should fit on most anything. They worked on my 99 TW and I don't believe the handlebar design changed (ever). Will these fit Pro Taper seven eighths bars on DR 650 ? BEST ANSWER: Yes. You may have to rearrange the do-dads on your handlebar tho. I have them on a KX125, KDX200, and a Husky TXC310 (with the kit to fit bulge bars). And the TUSK plastic guards are designed to fit the aluminum. Quite the tidy arrangement. I am not sure they will. we do not have those bars here to test them on that machine. these are for dirt bikes only but they do work with a lot of dual sports. These will fit right on with no additional parts. If you are using them on fat bars you will need the larger big bar adapters. , they come with 7/8" clamps. I see these say dirt bike only. Is there any reason i couldn't add these to my Honda TRX400X quad? BEST ANSWER: There is no reason why not as long as you have the room to mount them properly. I would however recommend the MX D-flex as they will protect you from the normal debris thrown your way. It is rare that a quad rider needs tree bashing protection. Concider the possibility of wrist injury during a over the bars dismount. I would think there would be no problem as long as your opening on your handle bar is big enough to allow the end of the handguard to fit into the handlebar.. If you have fat or oversized bars you would have to buy the adapter for fat or oversized bars.to make it work. 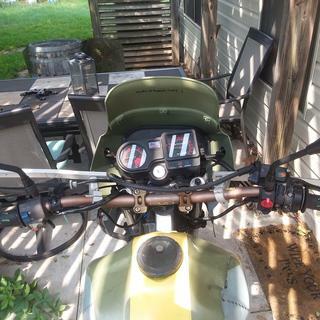 I installed them on my Kawasaki KLR 650 and because the mounts are adjustable they will fit almost all motorcycles and ATV's. They worked well for me. They should work on a TRX400X quad. 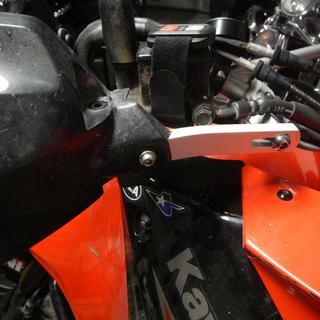 They are very adjustable and I have mounted them on a KTM50SX PeeWee bike and also on a KX6. 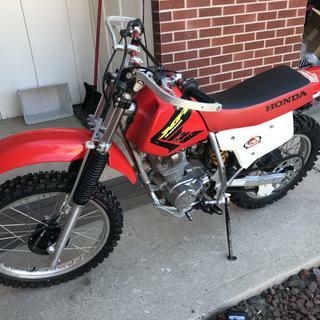 Will this fit a 2011 crf250r? Yes, these are a universal bike fit. Will these work with the tusk deflectors with the blinker built in on the enduro lighting kit? BEST ANSWER: I bought the Tusk aluminum handguards and Tusk reflectors with signals and they work flawlessly. Keeping the cable tucked away is a bit tricky but manageable! I bought these for my 09 XCF-450. 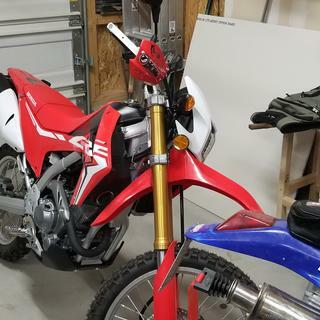 Unsure if they will fit around a blinker kit but there is good spacing overall and I am very pleased with look, fit and performance of the bars. 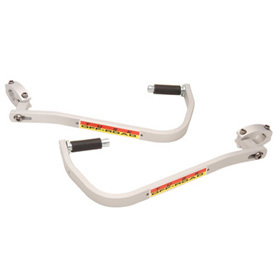 Will these fit the d-flex hand guards with blinkers? BEST ANSWER: Yes, these will work with D-flex handguards with turn signals included. I tried to install these on my sons 2002 cr125, they don't fit and interfere with the brake cable. Unable to get these to mount in such a way that they don't interfere. The bars are stock and tapered as well, according to the description looks like I also need to purchase adapters as well? How can I get a replacement nut that goes inside the handlebar and spreads the fitting? BEST ANSWER: You cannot get just the nut. You will need part # 1096870001. Will these work with the Tusk Aluminum Hand Guard? BEST ANSWER: These bikes come stock with 1 1/8" handlebars. You will need to order part # 1096460001 as well. Will these work with tusk aluminum handguards? Will these fit an Africa Twin? BEST ANSWER: They are universal so they should fit but you may have to move the controls around a little. Will these fit the Acerbis Vision guards? I am looking for something that attaches at both ends to use with the Acerbis Visions, unlike the Aluminum handguard that comes with the Visions. 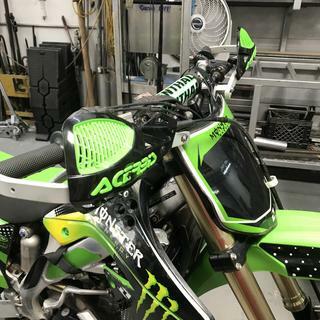 BEST ANSWER: It's not going to be an exact fit because of the bend of the Acerbis hand guards, but these might be able to be modified to work with the Acerbis handguards. Do these come with the plastic shields or do you have to buy those separately? BEST ANSWER: These do not include the plastic shields and are just the metal bars. See the attached item for the handguards with the hand shields!